I thought I would feel more wistful as he began to eat solids, but I didn’t. I find endless delight in his joy at eating. It’s so wonderful watching his face light up as he tastes something new. You know what pulled at my heartstrings? His diapers! This morning, I had to actually shake a real poo into the toilet. My last baby is making real poop, and that sent me into a weepy state of blubbering motherhood. I almost took a picture and I almost called my mother. I might have if it were after 7am. Instead, I hollered down for my husband to come see the baby’s giant poo and got more weepy when he declined. Doesn’t he understand? Our baby is growing up! Here, in his diaper, was proof. I couldn’t spend too much time feeling all my feelings, because the other children began to swing from the rafters, so it’s really hitting me even harder as I reflect back on it. 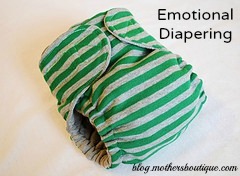 And then, of course, my rational mind is stunned that I’m feeling emotional about a dirty diaper. I’ve been so conscious that this baby is my last one and try to cherish each moment. Having three sons, I don’t get to spend a lot of time doing anything apart from the gritty, hands-on work of parenting them. I blink my eyes and a month has passed. I blink again and one of them has taken apart the pipes under the sink. I’m always so taken aback at the unexpected things that make me feel all mushy inside. What unexpected milestones really pull at your heartstrings? Leave us a comment to share your experience!